Russia’s biggest military exercise since the end of the Cold War is now underway, with a sizable contingent of elite Chinese and Mongolian troops participating. Chinese President Xi Jinping met with Russian President Vladimir Putin in Vladivostok on Tuesday for a bilateral summit on the sidelines of the Eastern Economic Forum. The five-day military exercise, held near Russia’s border with China, is scheduled to conclude on September 17. The event marks the first time foreign troops from beyond the Soviet military alliance have been invited to participate in a major Russian drill. Xi’s attendance in Vladivostok was the first time a Chinese leader has participated in the Eastern Economic Forum. 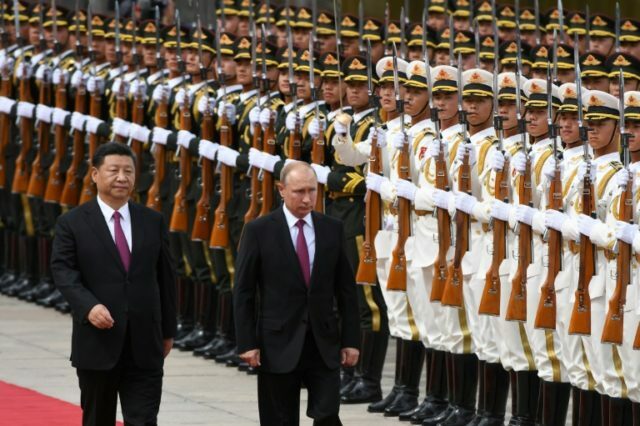 Not only is the wargame intended to demonstrate the close relationship between China and Russia, but analysts told the Wall Street Journal it will give the rapidly modernizing Chinese military invaluable experience at operating on foreign soil. The modern Chinese army has limited experience with establishing long supply lines, projecting military power to distant battle fronts, or working closely with a major military ally. “They need this kind of experience if they want to move beyond their own backyard,” Vasily Kashin of Moscow’s Higher School of Economics said of China’s goals. Another significant detail is that Chinese troops for the exercise were drawn from the Northern Theater Command, whose area of responsibility includes China’s border with North Korea. Chinese and Russian authorities gave assurances this week’s wargame is not intended to threaten or intimidate any particular adversary, but observers could not help noticing the equipment used and tactics practiced were largely devoted to countering the advanced capabilities that only NATO and the United States possess. Much emphasis is being placed on Chinese and Russian forces learning how to defend each other’s naval installations against missiles and heavy aircraft, for example. Terrorists and separatist movements do not lay siege to naval bases with aircraft carriers. “The anti-Western atmosphere surrounding the exercise is unmistakable,” Clint Reach of the Rand Corporation told the Wall Street Journal. Russian state media touted several important trade agreements signed by Xi and Putin at their summit in Vladivostok. Trade between China and Russia increased sharply over the past year. The Diplomat on Wednesday wondered why Xi waited so long to join the Eastern Economic Forum, given that almost every other heavy hitter in Asia has attended, including countries like Japan and South Korea that are much less friendly to Russia than China has been over the past decade. China previously sent low-level ministers to the event while the rest of Asia sent heads of state. One explanation is that China sought to avoid irritating the United States, a concern that evaporated as Xi fought a trade war against the Trump administration. Russian trade is helping to cover the bruises from a trade battle that proved much tougher for China than Xi, or most analysts in America for that matter, anticipated. Xi is also eager to mount any stage that gives him a chance to rail against American “protectionism” to an audience that will not laugh out loud at the spectacle of a Chinese leader complaining about closed markets and broken trade rules. Another possibility is that Russia was a bit nervous about giving a platform to Xi, already a more powerful and influential global figure than Putin, and a much more plausible candidate for the Best New Authoritarian Global Hegemon of the 21st Century award. Russia’s state-run RT.com applauded Xi’s remarks but could not help noticing that he bragged about the size of China’s delegation to the EEF and China’s growing economic strength. On that note, China’s stock market hit a 31-month low while Xi and Putin were celebrating their bright economic future, and analysts said the Chinese market still has a couple of months to go before it hits rock bottom. One of the most surprising consequences of the Trump-Xi trade war may yet be Beijing loosening its authoritarian control of the Chinese market and introducing some modest liberal reforms to restart its stalled economic engine.